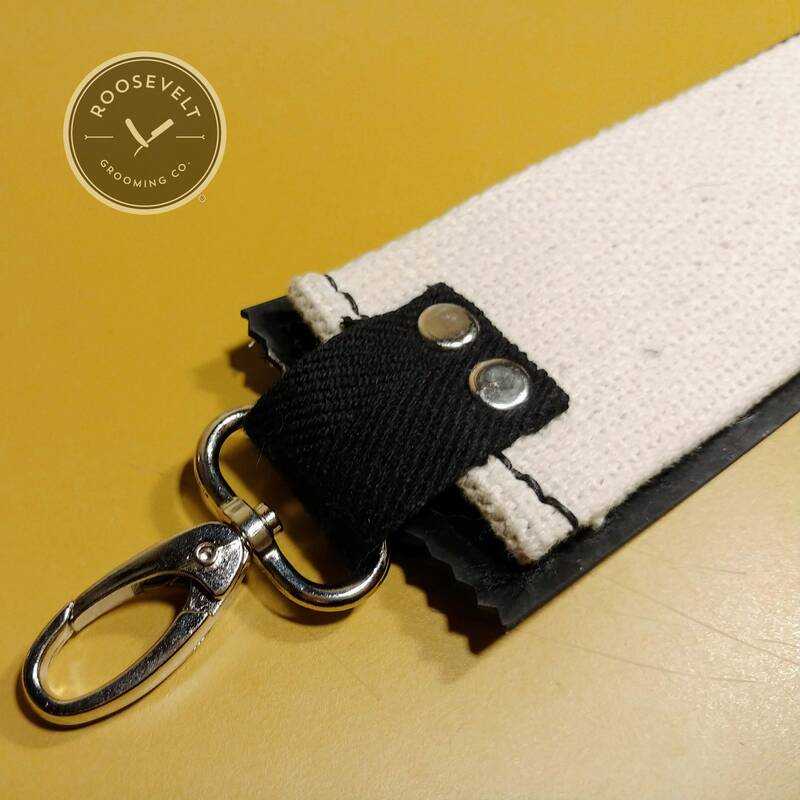 This animal-friendly alternative to our traditional shaving strop is made to the same specifications without the inclusion of any animal products. 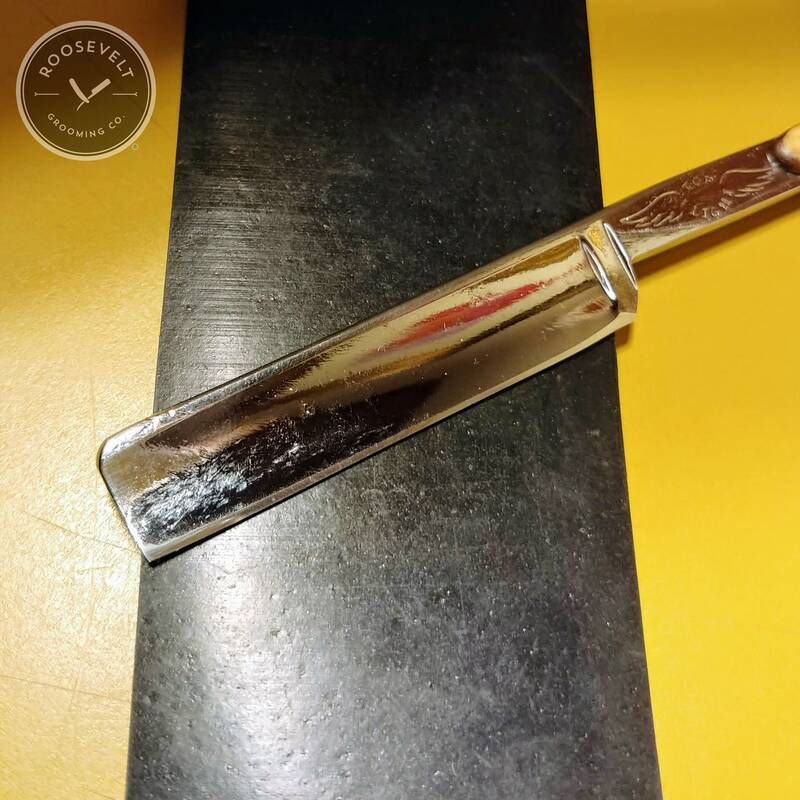 A high-quality, synthetic-rubber surface provides the perfect vegan solution for daily razor maintenance while the cushioned handle, covered in black, faux-suede, offers comfort and an effective gripping surface. 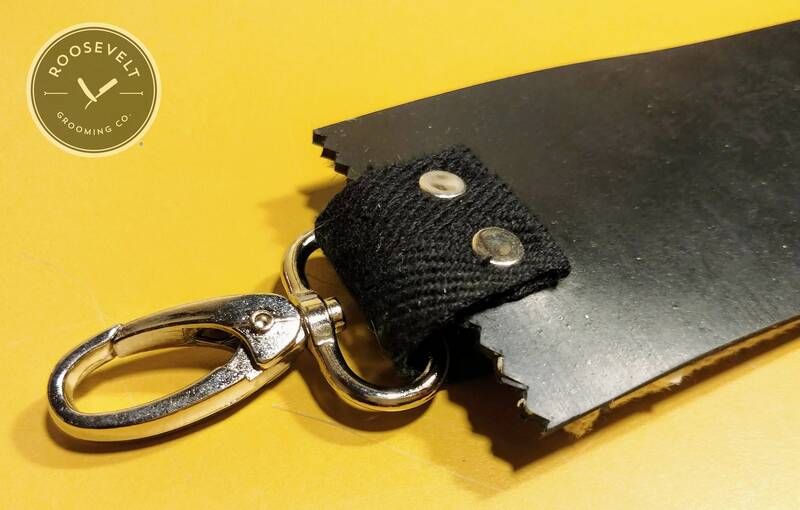 This strop's lobster-clasp-style clip allows you to quickly attach and detach this strop, and rotate it easily during use. 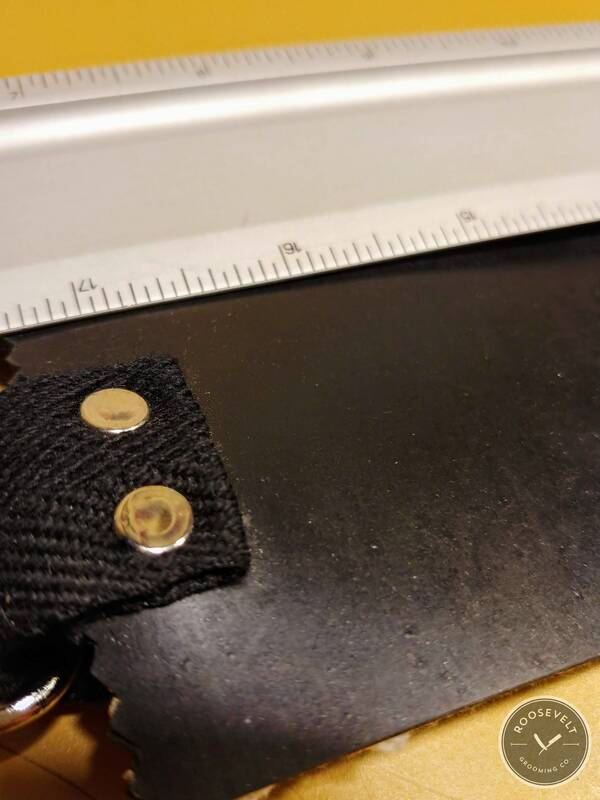 In addition, our vegan strop provides a medium/heavy pull without the need for strop dressing or the additional care that leather strops require. Strop features a cotton canvas back and 2 1/4-inch, stropping surface. 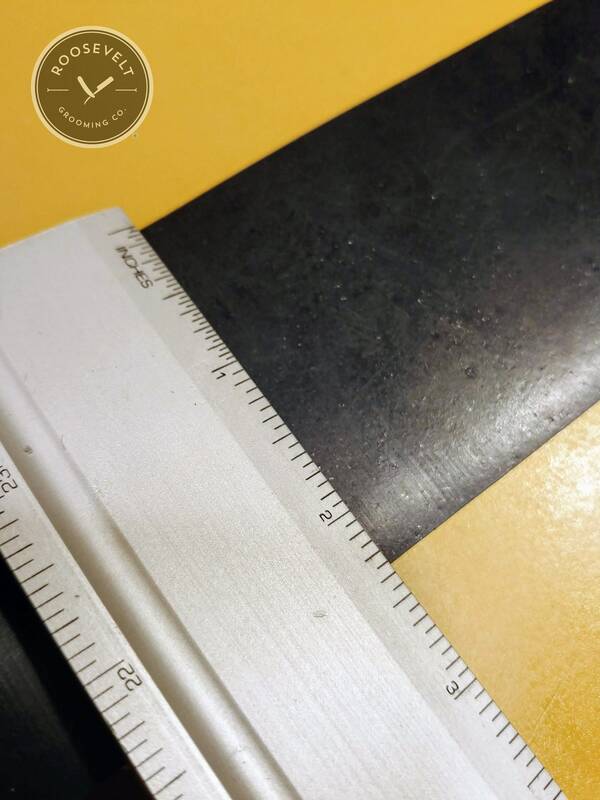 Stropping Surface Length: 16 1/2"
Stropping Surface Width: 2 1/4"
You may return any order within 30 days of receipt for a full refund. Must be returned in same condition as shipped. All of our items come with a 2-year guarantee. Roosevelt Grooming Company stands behind each and every one of our products and will be more than happy to repair or replace any product that disappoints you after the 30-day refund period. Please contact us before you return any product. To fulfill your order, you must provide us with certain information (which you authorized Etsy to provide to us), such as your name, email address, mailing address, payment information and the details of the product that you’re ordering. You may also choose to provide us with additional personal information if you contact us directly. - Compliance with laws. We may collect, use, retain, and share your information if we have a good faith belief that it is reasonably necessary to: (a) respond to legal process or to government requests; (b) enforce our agreements, terms and policies; (c) prevent, investigate, and address fraud and other illegal activity, security, or technical issues; or (d) protect the rights, property, and safety of our customers or others. Roosevelt Grooming Company, LLC may store and process your information through third-party hosting services in the US and other jurisdictions. As a result, we may transfer your personal information to a jurisdiction with different data protection and government surveillance laws than your jurisdiction. Roosevelt Grooming Company, LLC is a US-based business and you should expect that your information will be transferred to the United States in order for us to complete the order process. - Change, restrict, delete. You may also have rights to change, restrict the use of or delete your personal information. Absent exceptional circumstances (like where we are required to store data for legal reasons) Roosevelt Grooming Company, LLC will generally delete your personal information upon request.